The 8 puzzle is a simple game which consists of eigth sliding tiles, numbered by digits from 1 to 8, placed in a 3x3 squared board of nine cells. One of the cells is always empty, and any adjacent (horizontally and vertically) tile can be moved into the empty cell. The objective of the game is to start from an initial configuration and end up in a configuration which the tiles are placed in ascending number order. In this site, information about the following subjects will be provided to you. 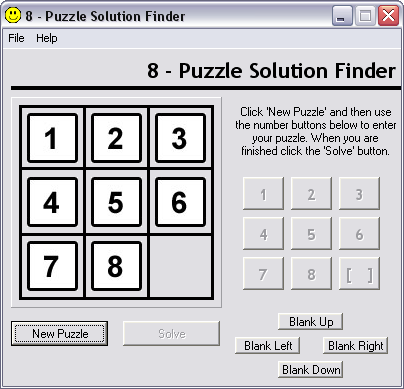 8 Puzzle Solution Finder Download is available now. Click Here..